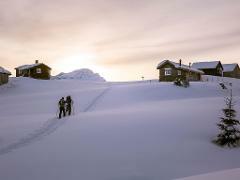 Would you like a taste of the Norwegian winter and the magnificent landscape? At this 2-4 hour trip you will get a beautiful nature experience with a beautiful scenery and quietness only pure nature can offer. 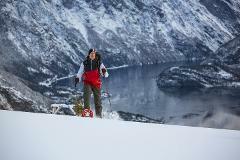 Would you like to climb a Norwegian mountain during winter? 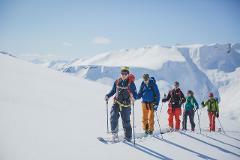 Then this snowshoe hike to Peak Mefjellet (1100 meters / 3609 feet) is the perfect mountain! 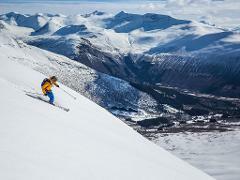 This half day tour will give you a tast of the Norwegian mountains. 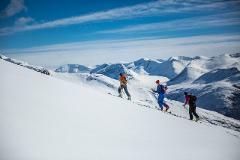 This tour is perfect if you are in normal physical shape and have experience with alpine skiing or snowboarding. 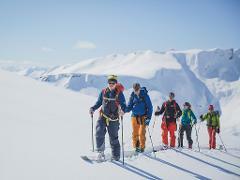 This daytrip will bring you deep into the Norwegian mountains, and are demanding physically and will test your ski technique. You therefore need to in good physical shape and be an experienced alpine skier or snowboarder.